Seriously, it doesn’t worth it that you gain every desirable position, pleasure and possession of this world and go to hell fire at the end; think about it, does it worth it that you gain less than 100 years pleasure of this life and get more than 1 Million years of pain and plague in life after? Dear, it does not worth it that you lose your soul in eternity just because of temporal profits of this present and passing world, are you a fool? Do not delays to forsake your sins to experience genuine salvation just because of the profits, pleasure or popularity that you may lose; or because of the persecution you will face. There is nothing in this world as important and precious as the salvation of your dear soul. The end is imminent than you imagine. Repent, confess and forsake your sins as you accept the lordship of Jesus Christ into your life. Beloved, it does not worth it that you give up your garment of holiness, your purity and faithfulness in Christ simply because of the promising gain of this world; it does not worth it that you surrender your standard in Christ just because of the fear of persecution and problem of life. Will you allow Satan to fool you to give up your precious eternal life just because of this passing pleasure of this world? Will you compromise your purity and righteousness in Christ just because of money and the craving for riches? How foolish will that be? Will you fall into sin just because of fear of men for persecution or unknown problem? 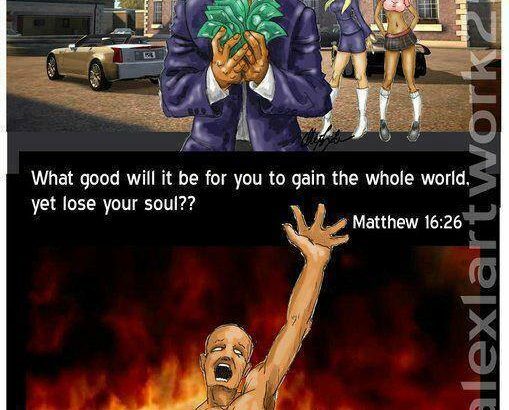 How will you be stupid to give away your gift of life just because of the gain of this going-away world? Do not fear persecution of men or problem of life and fall into sin, for it is better to die in Christ for not compromising into sin than to dine with Satan for committing sin. Do not fall into sinful demand and system because of earthly riches, pleasure and possession, for it is better to maintain purity in poverty and end up in eternal riches than to make prosperity and profits by worldly wisdom and end up in eternal damnation. Be wise, be warned and wake up unto righteousness, for our salvation draws nearer than when we first believed.